Cocktails served in a coconut? Yes, please. 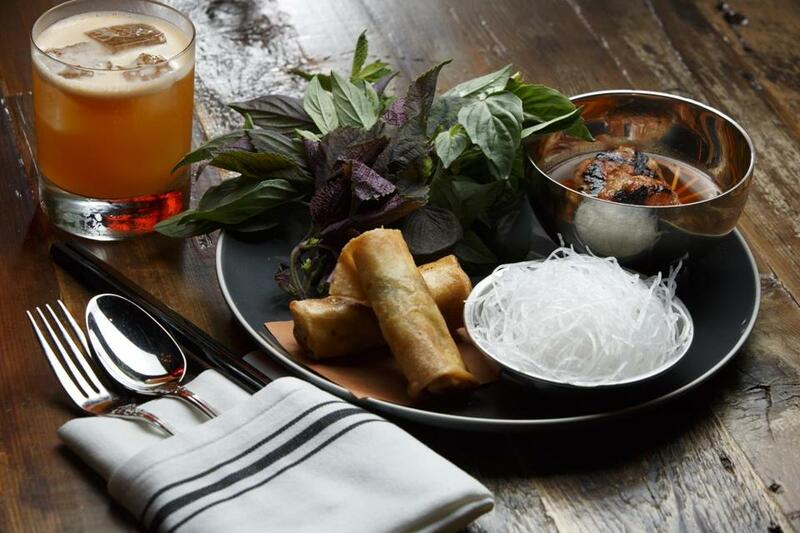 Where to Tiger Mama, a new restaurant in the Fenway from chef Tiffani Faison (Sweet Cheeks) and wife/co-owner Kelly Walsh, featuring the flavors of Southeast Asia. What for If you’re a “Top Chef” fan (Faison was a finalist on the first season). If you’d love to take a trip to Thailand or Vietnam but can’t hop on a plane just this moment. If you want to drink alcohol from a coconut. The scene An elephant of shimmery mosaic tiles welcomes guests at the door. The restaurant is filled with warm wood and palm fronds, with a bar at the front and a tiki bar toward the back. A bright fuchsia wall is covered in thriving green plants. It feels like eating in a tropical rainforest, one that also happens to have tables equipped with lazy Susans. Groups of friends spin them hungrily, folding grilled pork patties into lettuce leaves with herbs. At the tiki bar, young women sip drinks made with shaved ice and peruse Instagram. A chef’s table overlooks an open kitchen. Strangers become friends over platters of papaya salad and lobster curry. What you’re eating Nam prik is a spicy, garlicky, pungent dip made of green chiles, served with scooped-out cucumbers and an airy, arching pork cracklin’. There are lobster fresh rolls, mala mushrooms, pork pad see ew with cauliflower sambal, crab fried rice. Banquet-style dishes serve the table — chili crab comes two ways, with the wok-roasted head and claw tips on one plate and a slew of butter-poached legs on another. On the side: a squishy loaf of sweet-and-savory milk toast. Care for a drink? The Indo-Fizz — Old Monk rum with fresh turmeric, coconut milk, ginger-honey syrup, and egg — tastes like a butterscotch Lifesaver dipped in curry. A drink called Old Saigon features shochu, cardamom bitters, sparkling Malbec, mint, and lime. At the tiki bar, the Dutch Holiday is a gulp of Bols Genever and lemongrass-kaffir syrup with coconut ice, served in a coconut shell with a long silver spoon-straw for sipping and scraping.